Iceland’s Central Highlands, one of the largest remaining wilderness areas in Europe, are under threat. Iceland’s National Power Company, Landsvirkjun, plans to develop a large dam project that would generate electricity for an aluminum smelter. The project is an example of old-style, government-promoted heavy industrialization. If implemented, it will have serious environmental impacts, and face considerable geological, economic and legal risks. The Karahnjukar Hydropower Project will consist of nine dams, three reservoirs, seven channels and 16 tunnels. It will supply electricity to the Reydaral smelter, an aluminum smelter with an annual capacity of 322,000 tons that is being developed by US transnational Alcoa Inc. 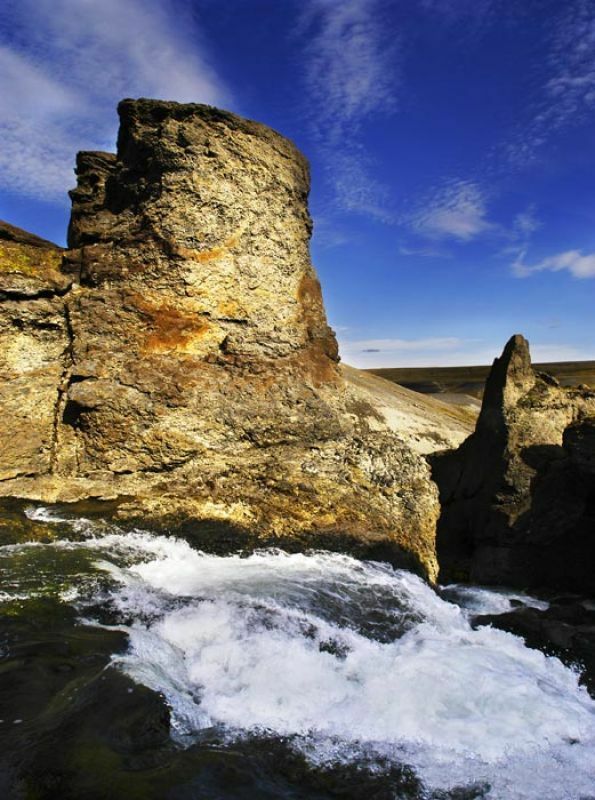 The Karahnjukar project will divert two large and several smaller rivers in Iceland’s Central Highlands, and will destroy or spoil about 60 waterfalls and invaluable geological features, including the unique Dimmugljufur canyon. Through submergence, river diversions, groundwater changes and erosion, the project will impact more than three percent of Icelandís land mass, including areas with rare vegetation, and the habitats of seals, reindeer, fish, and pink-footed geese. It is located near the worldís volcanically most active area, and has geological risks that, according to experts, have not been adequately assessed. Alcoa is marketing the Iceland dam and smelter project as an example of its efforts to reduce the emission of greenhouse gases. However, Iceland has managed to negotiate an exemption clause from the Kyoto protocol, and this provides a loophole for the considerable greenhouse gas emissions of aluminum smelters in Iceland. The planned smelter falls considerably short of important international emissions standards. The tariff Alcoa will pay for the power from Karahnjukar will depend on future aluminum prices. The project will only become cost-effective if the present downward slide of the aluminum price can be reversed. An independent evaluation that was based on more cautious assumptions than the economic analysis commissioned by the developer concluded that the project has a negative net present value of $425 million, and will result in annual losses of $36 million. The Karahnjukar project did not receive a high ranking in the interim report of Iceland’s Master Plan for Hydro and Geothermal Energy Resources. It is clearly a political project, promoted as an effort to support the economy of East Iceland. EFTA’s Surveillance Authority considered that such ìinvestment aidî could be approved as ìregional aidî. Old-style state subsidies for energy-intensive industrialization do not adequately address the problems of a region that does not primarily need jobs, but educational and cultural opportunities. Government support for education, infrastructure and eco-tourism would appear to be a more promising alternative. There is no global need for the aluminum that would be produced by the new Reydaral smelter. Alcoa, the world’s largest aluminum manufacturer, has not increased production in recent years. The company is shifting some of its smelting capacity to low-cost countries such as Iceland as a cost-saving strategy. Furthermore, Alcoa produces aluminum sheet for 100 billion beverage cans a year. At the present recycling rate, this requires about 700,000 tons of aluminum to be smelted from new ingot every year ñ or twice the capacity of Reydaral. The new smelter, with all its environmental impacts, could easily be substituted by higher recycling rates. The Karahnjukar project will cost an estimated $1,086 million. Landsvirkjun intends to raise the respective funds from international financial institutions, including the European and Nordic Investment Banks, and from private banks. 120 nongovernmental organizations from around the world have called on financial institutions not to fund a project that has massive environmental impacts, is politically motivated, and does not bring benefits that would justify its serious impacts. Financial institutions should fully assess the risks of the Karahnjukar project, including to their reputation, when considering funding this dam project. The full document is available as a pamphlet in pdf.